Farmer-led Wisconsin watershed groups study local concerns. Wisconsin is America’s Dairyland, home to 1.2 million cows and 25% of the nation’s dairy herds. That industry is displayed against a backdrop of more than 35 million acres of rolling hills and picture-perfect countryside. It also is a state with abundant waters. Minnesota claims the “Land of 10,000 Lakes” title; when compared to that neighbor, however, Wisconsin has double the surface area covered by water — 17.3% versus 8.4% — according to the U.S. Geological Survey. Watershed watch. There are more than 330 watersheds in Wisconsin, a lot of water to monitor and protect. That’s why state officials want boots on the ground — a farmer’s boots —looking for solutions to water impairment issues and helping to implement practices that correct those problems. Wisconsin’s Department of Agriculture, Trade, and Consumer Protection issued nearly a quarter-million dollars in 2016 through its first Producer-Led Watershed Protection Grants program. The state’s ag secretary, Ben Brancel, points out that the money went to 14 different groups of conservation-minded farmers across the state, funding efforts to address local soil and water resource concerns. 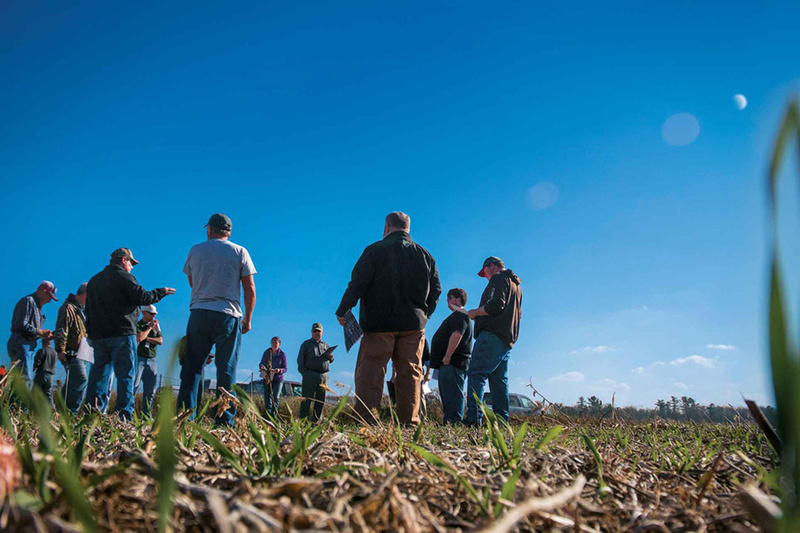 Demonstrations track how cover crops following soybeans help boost soil health. Water quality problems related to phosphorus have been one of the issues documented across the state. High phosphorus levels cause algal blooms and excessive plant growth in area lakes, and contribute to low oxygen levels in streams. There are many potential sources of phosphorus —construction site erosion, streambank erosion, human and animal waste, fertilizer, and organic matter — but agriculture clearly is in the spotlight. Sharing the info. Some of these groups are already off and running.Farmers of the Barron County Watersheds (FBCW) is a farmer-led group in northwest Wisconsin that got a jump start from a grant after the county hosted the Wisconsin Farm Technology Days farm show. FBCW received a $16,000 grant from the recent state action, money that will be used primarily to address nutrient and sediment loading in the Yellow River watershed in Barron County, an area with a strong dairy industry. Farmers learning from farmers is the idea behind FBCW. Immediately following the 2016 fall harvest, FBCW held a field tour to demonstrate successes (and some failures) involving cover crop mixes and various cover-crop seeding methods. 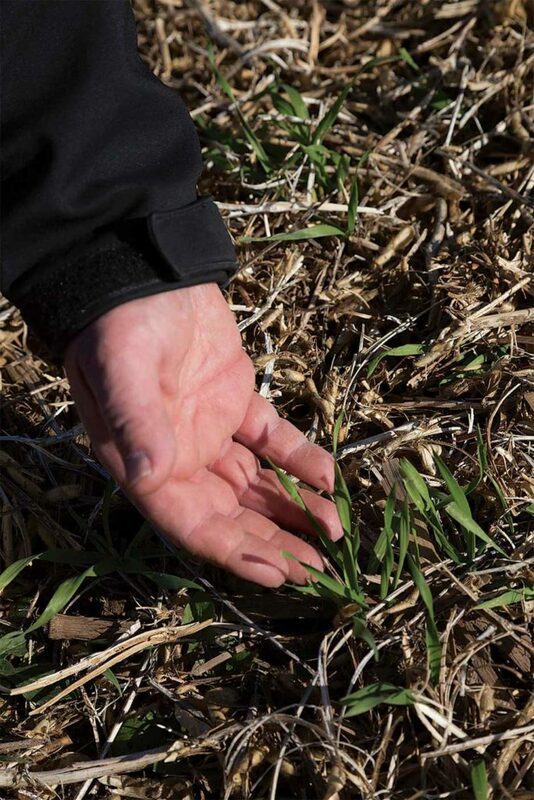 FBCW also helped encourage cover crops following the 2016 harvest by offering a “cover-crop rebate,” a cost-share payment for successfully establishing a cover crop. The payment was $6 per acre within the targeted Yellow River watershed; $4 per acre outside the Yellow River watershed but within Barron County; with participation limited to 500 acres per producer. Field days allow Farmers of the Barron County Watersheds to share information. Shoulder responsibility. The common theme among all the farmer-led groups across Wisconsin is a desire to get involved in the search for answers to resource concerns. That quest heads out in many directions; for example, the Buffalo-Trempealeau Farmer Network will be looking to improve nitrogen application in the Elk Creek watershed, working with the University of Wisconsin Discovery Farms to evaluate application rates, timing, and methods. Meanwhile, the Farmers for Lake Country in the Oconomowoc River watershed, along with Tall Pines Conservancy, will offer incentives for filter strips, cover crops, and reduced-till systems.